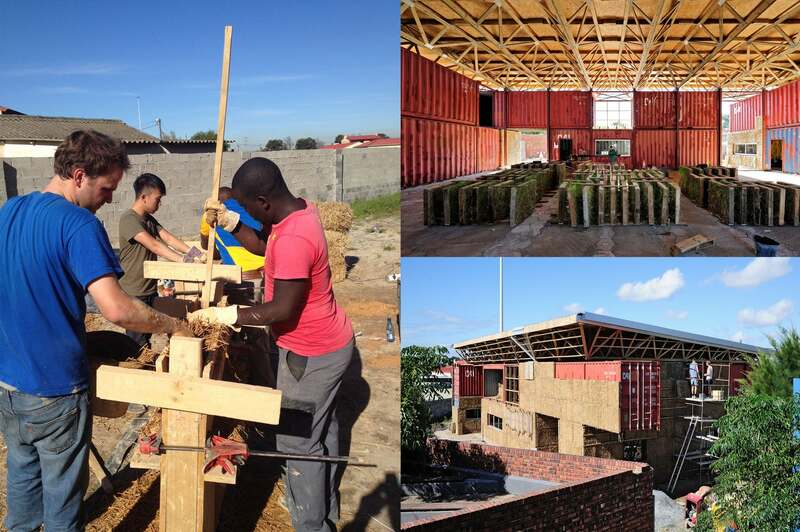 This project is part of a program where students from the Georgia Institute of Technology design and build an extension to Arts and Culture Centre Guga s’Thebe in Langa in South Africa in collaboration with two German Universities (RWTH Aachen University and PBSA Düsseldorf) and local architects (Carin Smuts, CS studio) under involvement of the local community. Starting from the first design sketches and models to detailed design plans students experience all phases of a construction project. Detail design, calculating quantities, scheduling, financing/sponsoring and cost control are part of the task. 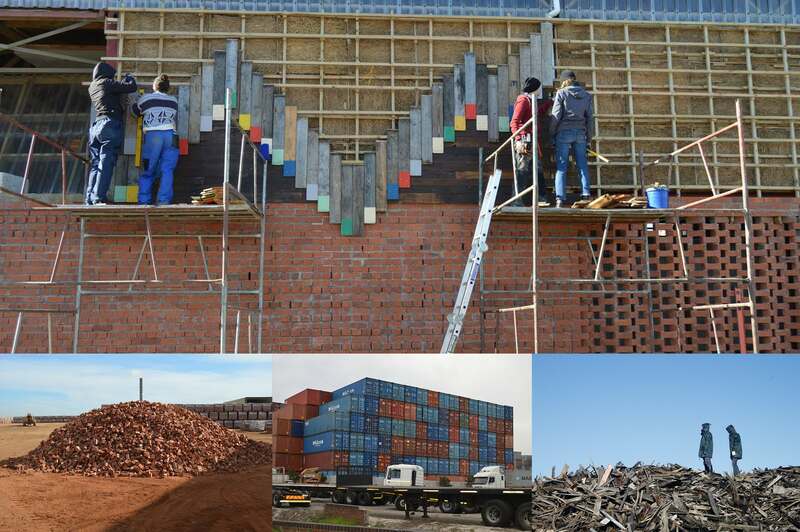 During the construction phase students as well as unskilled local workers learn how to deal with different construction materials and their specific application as well as the entire building process from constructing foundations to the cladding of a building. Through teamwork and selective prefabrication of building components in the Digital Fabrication Lab at Georgia Tech the project can be built within a short time span. The video above courtesy Daniel Baerlecken details the process of design, developing and building the theatre. You can also find out more about the project on its official website. 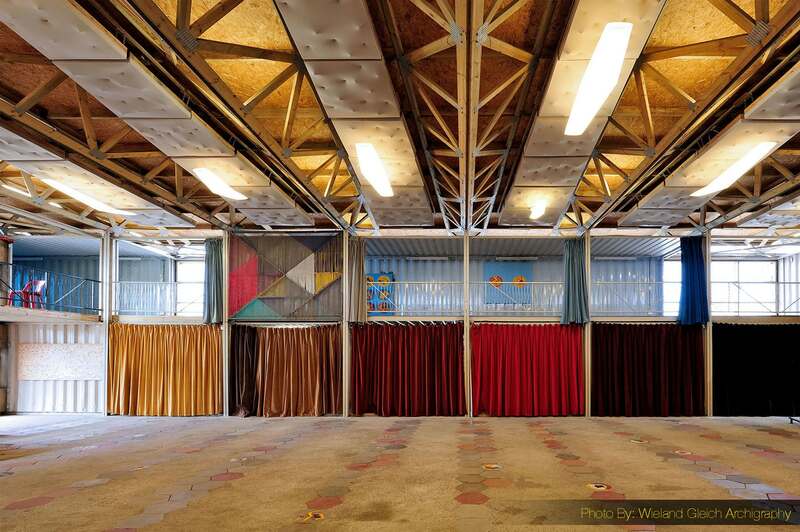 The Guga S’Thebe Children’s Theater is an expansion of the existing Arts and Culture Center Guga S’Thebe (by architect Carin Smuts) located in the heart of the Langa Community in Cape Town, South Africa, attracting local children, adolescents, and artists, as well as international tourists. 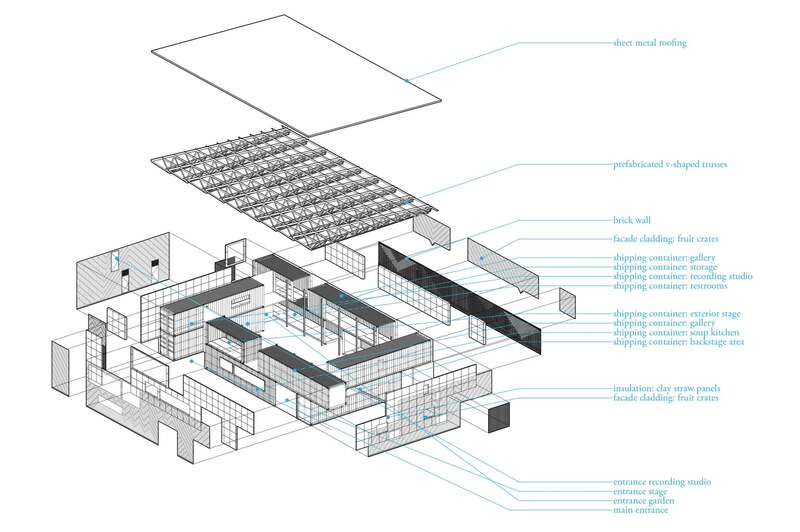 Referencing historic and cultural properties of the site, the rectangular building volume is rotated creating an almost triangular square between the new theater and the amphitheater. 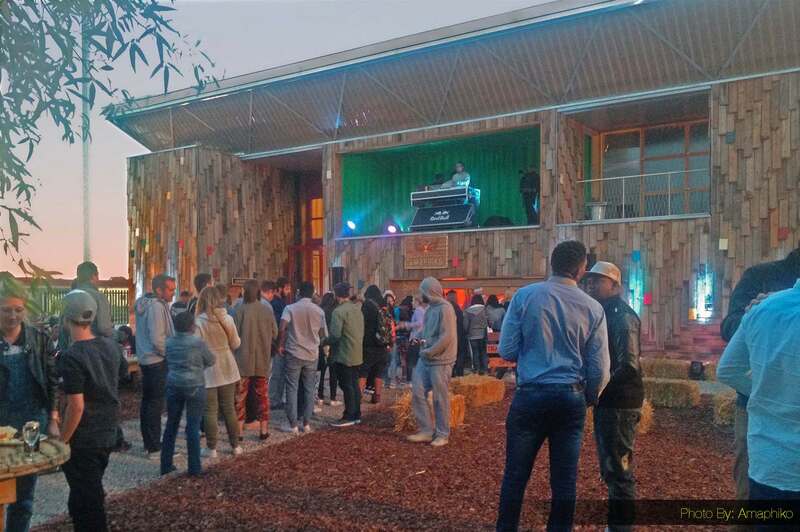 The square serves as internal courtyard and as open auditorium for the exterior stage. 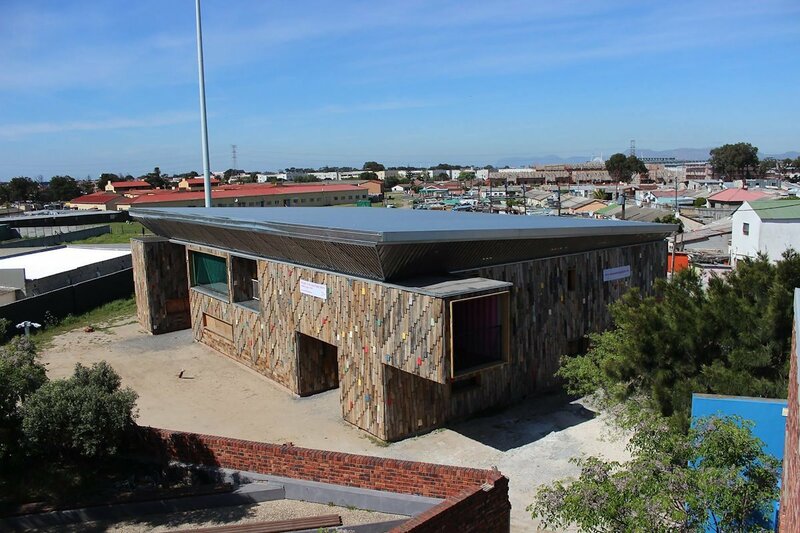 Position and rotation of the building volume is based on an existing path which was grown informally during the apartheid era as a connection between the former barracks and the post office, this pathway was and is an important space for informal exchange. 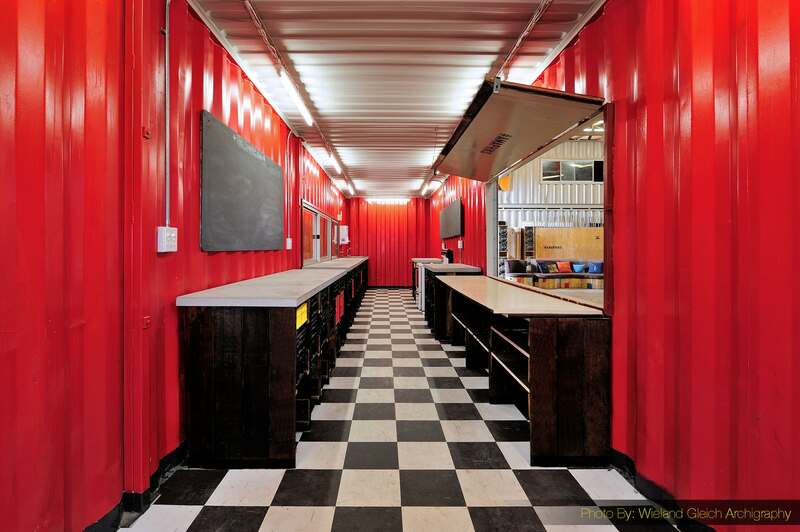 Utilizing readily available and inexpensive shipping containers, the building’s rectangular footprint is defined by eleven stacked and staggered used shipping containers. 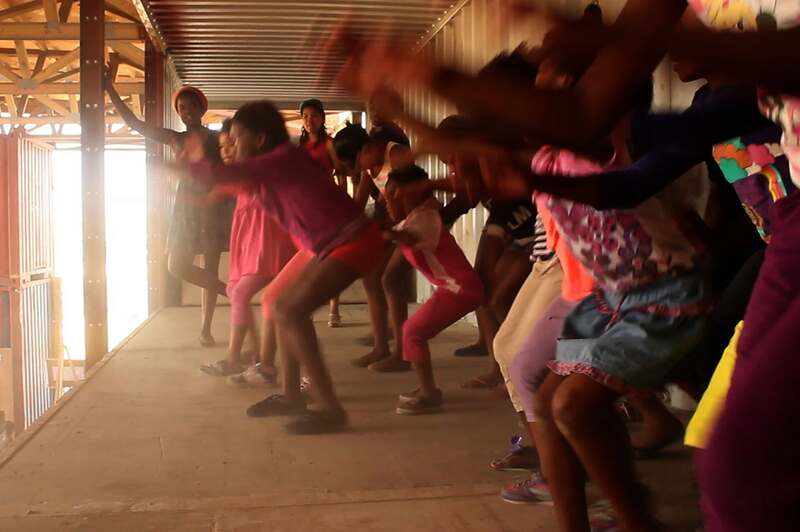 The two level high boundary of the container wall defines the interior enclosure of a multifunctional theater (seating for 200 people) with a reconfigurable stage and exterior spaces, such as an outdoor stage, children play areas, and a garden. 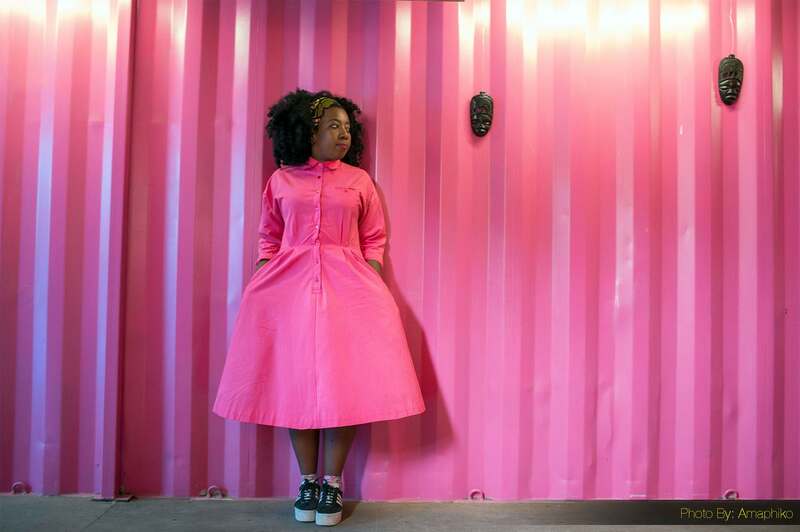 Numerous auxiliary spaces are contained within the width of the container wall, which include backstage areas, a soup kitchen, a room for stage direction, recording studio, workshops, and spectator balconies, creating a color pop as bright colors contrast against neutral tones of the large corrugated acoustically diffusing surface wrapping the performance space. 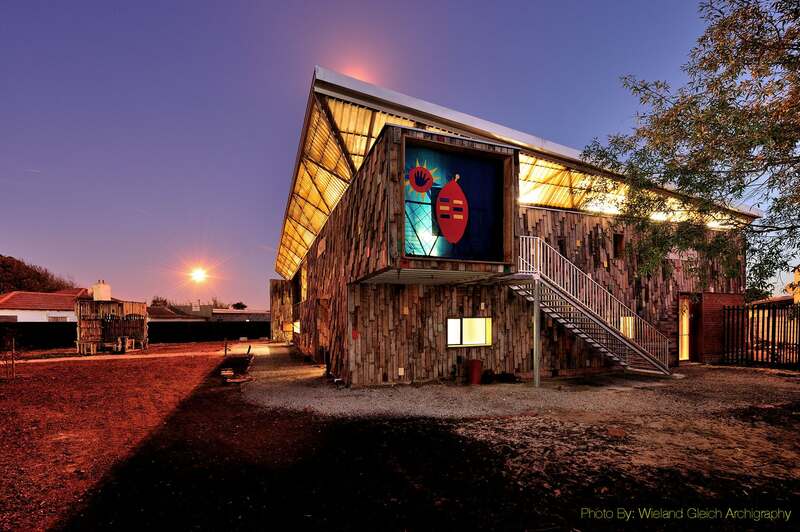 Local artists and textile designers collaborated and made a series of interior and exterior textile panels that act as screens, windows and acoustic quilts. 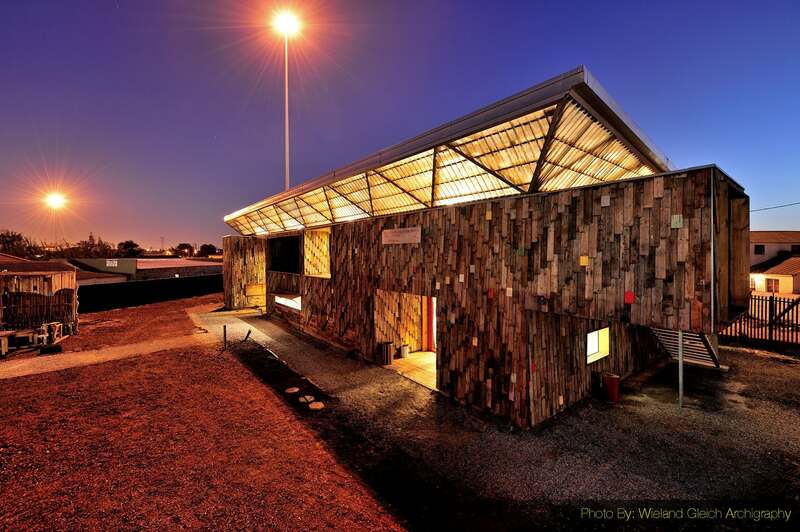 Double-story steel columns line the interior of the container wall supporting v-shaped pre-fabricated wood trusses and a metal roof that hover above and extend past the container wall suspending a plane of acoustic absorbers and lights. 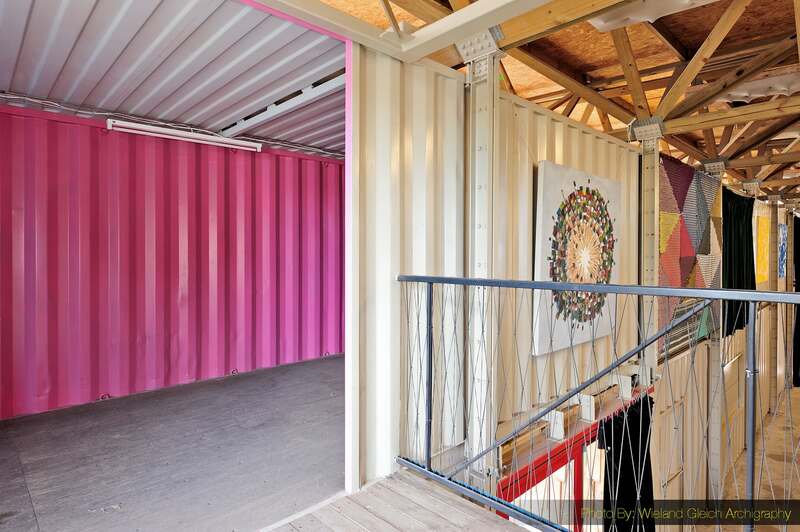 To improve the interior climate, the container walls were insulated with a layer of light clay panels, which were fabricated on-site. 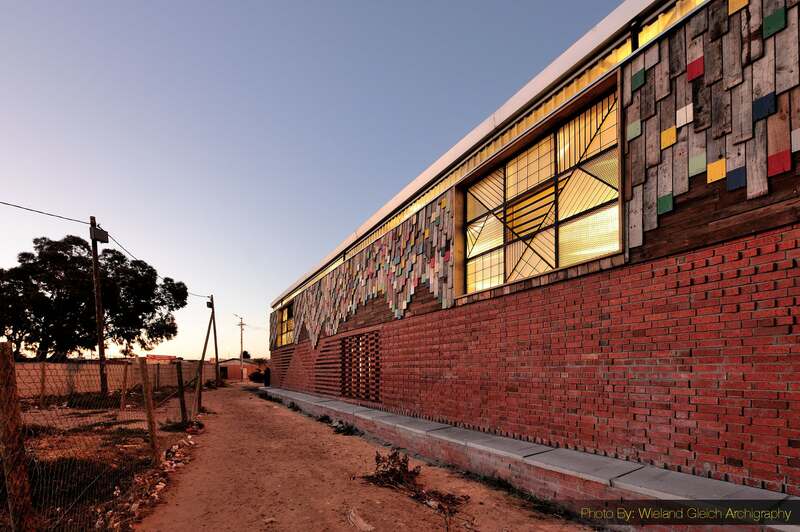 The façade’s unique patterning is derived from researching the traditional Xhosa beadwork, giving systematic configurations that adapt to different orientations of the building and transitions to other materials – from wooden shingles (re-used planks from fruit crates provided by the local agriculture) to brickwork facing the historic path. 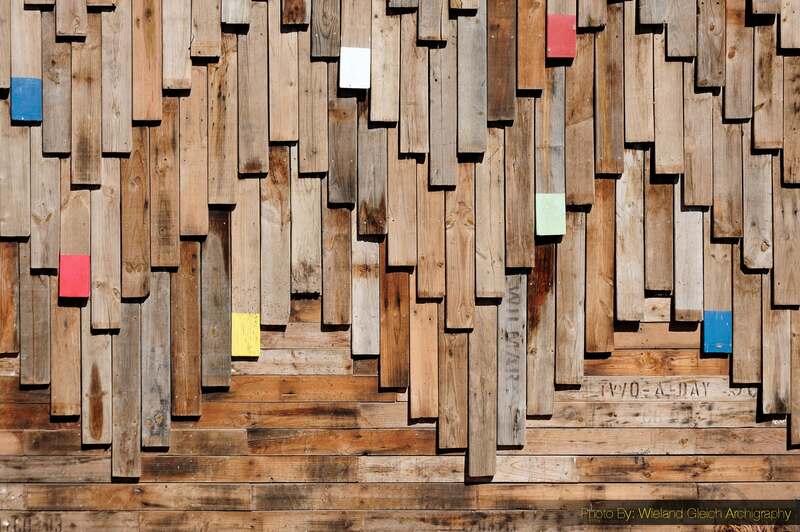 Vernacular traditions research in construction methods combined with industrial reused or recycled waste materials and naturally renewable earth materials define the design team’s parameters for the Design/Build framework and pedagogical structure. Focused on full-scale prototyping and material experiments, architecture students from three international schools – the Georgia Institute of Technology (Atlanta), the Peter Behrens School of Arts (HS Duesseldorf), and RWTH Aachen University (Aachen) – embarked on an international collaboration to make impact through design. Participating students lead all phases of design and construction. 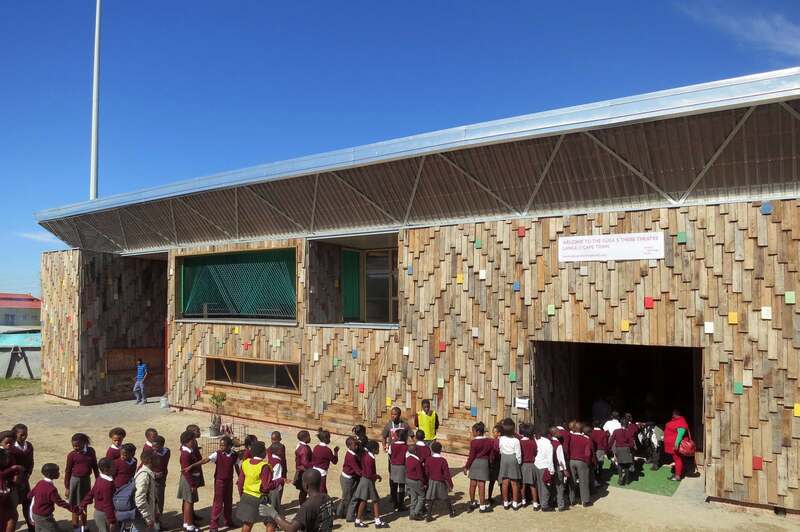 During the construction phase, students worked alongside members of the community, learning how to work with an array of construction materials and their specific applications alongside developing a strong awareness and respect for another culture and its surrounding environment. 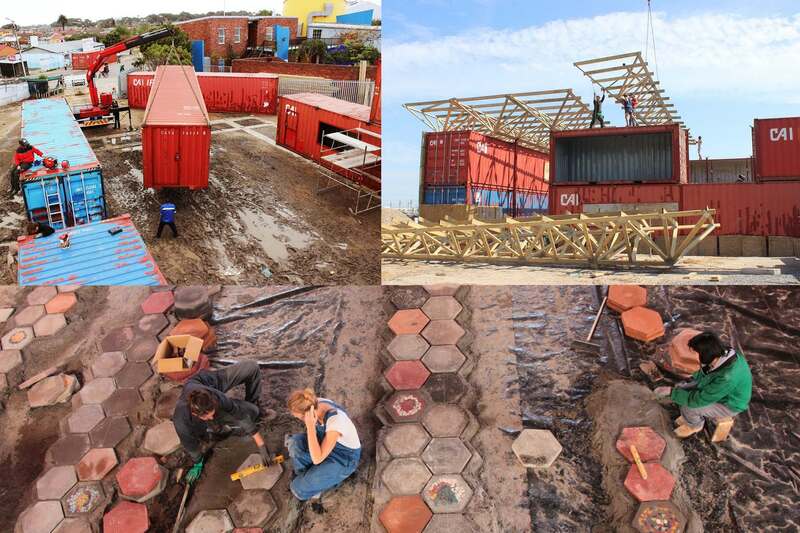 This pedagogy allows for an understanding of architecture as a social practice with all of its attendant cultural implications.